We think that gardens are best served if they are presented on an expanse of land, free to bloom hither and thither, filling our field of vision. Of course, that requires a decent amount of space. But what if you don’t have the square footage to landscape the traditional way? You may resign to a few hanging planters suspended from the ceiling or windowsill to fulfill your green thumb. But the possibilities don’t end there. 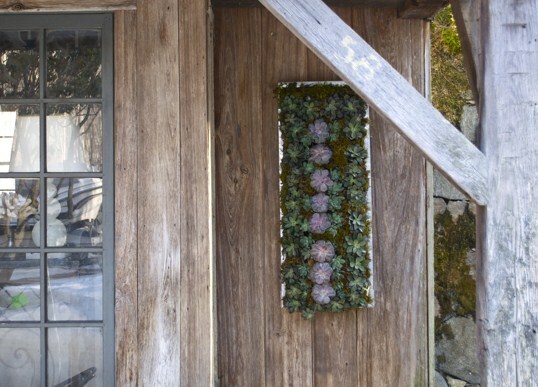 A vertical garden is a viable option to have purposeful foliage even when horizontal space won’t allow for it. Plants that require little soil and water work best for this arrangement. A wall garden may consist of a simple vine scheme. Succulents are also easy to care for, while creating a lushness. Fashion a design inside the garden. Flowers aren’t banished from the list, either. Gardening can be a challenge especially when ground space is limited. Why not go up? Unused interior or exterior wall space is very easily enhanced by hanging flat planter boxes, wall fountains, coral, colorful dishes (yes!) or anything that can be attached to a flat surface. A little ingenuity and creativity is all that is needed to create a spectacular impact. Remember, if using smaller items (coral, fish, mirrors, etc) the effect is greater if a large volume of the item is used. Large wall art can be placed singly, in pairs or trios to create geometrical and structural effect. Please inquire about our custom-made lightweight zinc wall planters. Created to encase baby ferns, ivy, succulents or multiples of any 2-3″ potted plant, these slightly industrial rectangular wall planters are affordable, extremely interesting and fun to plant. Reserve yours now or special order complete with plants. Sizes range from 20″ x 30″ to 36″ x 48″.